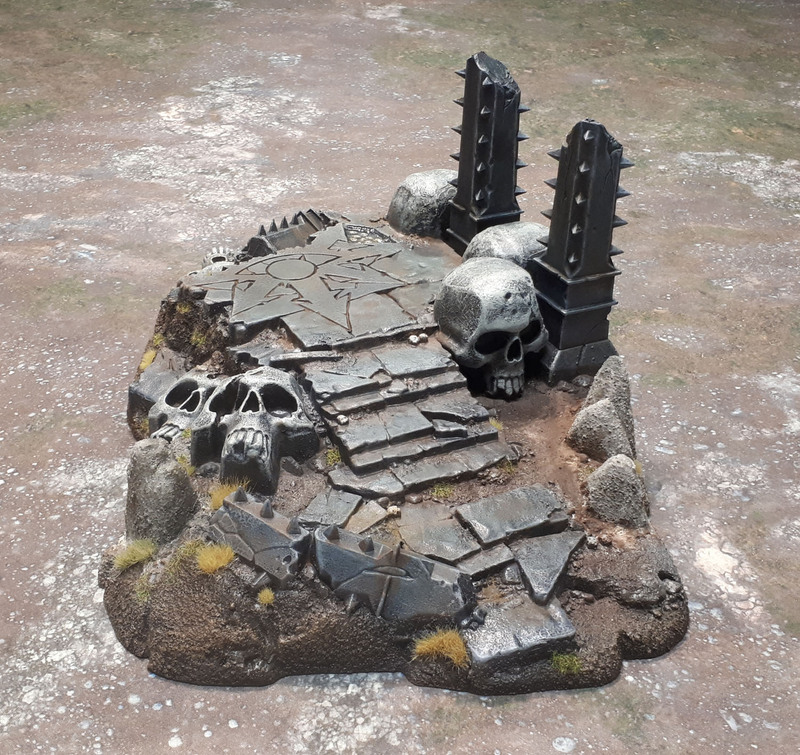 Temple of Skulls (Citadel Miniatures) | Azazel's Bitz Box. 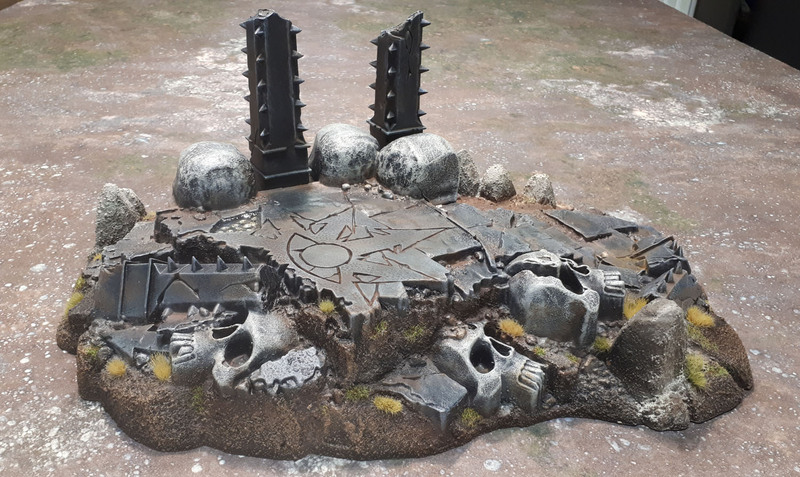 This entry was posted in Wargame Scenery and tagged Temple of Skulls Citadel Miniatures. Bookmark the permalink. 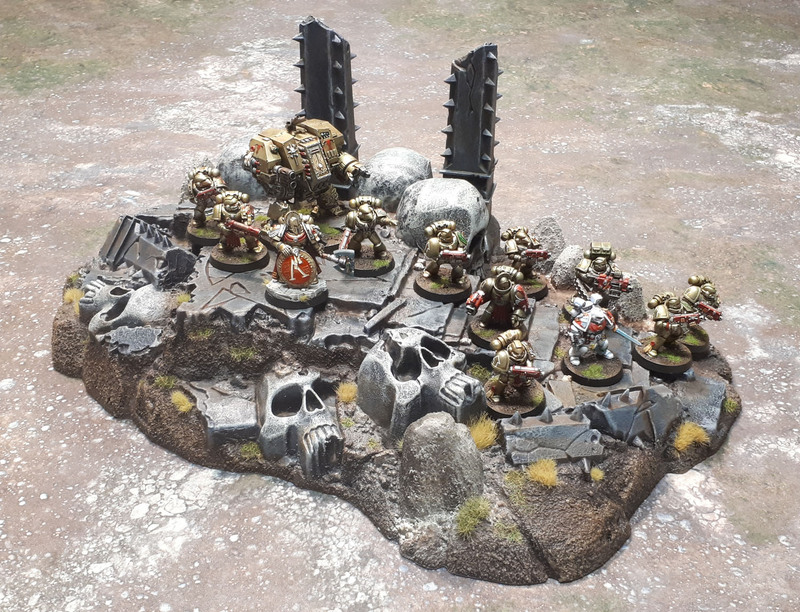 So close to being able to call it a diorama ;-)! Very nice mate, a nice little kit. If it were a diorama though, I wouldn’t be able to play with it! I should do a dio sometime, but for the time being I’ve got so many models to paint (especially the neglected hordes) that I feel like I just need to hammer on through for the meantime. I think you’re being too hard on yourself here, I think it came out looking great! Personally I don’t mind the kit, but it sure is very “Warhammer”. Looks good though, and glad you got round to finishing it. It’s not bad, especially after the “fixes”, but I’m still salty about the textures visible in their box art compared to the actual model. Very cool stuff Azazel! I think the weathering powders make a big difference. Definitely have an impressionistic feel to them, but a great little tool to have for stuff like terrain. Thanks for the shout out, glad and a bit humbled to have given a bit of inspiration that helped you to finish off this beauty. Most welcome, Mark – and thank you! As you say, the powders are a great tool to have at our disposal. Sounds pretty painful, but you ended up with a really nice looking piece there. Yours looks much better than what they did on the cover photo. From the cover photo alone, I’d probably pass on buying it. Doesn’t help that they shot a pic of it on a grassy field. This reminds me that I have so much to learn about painting stone. I’m always pretty impressed with how you’re able to get a really nice stone effect. This is a great example, as you have several different stone techniques. 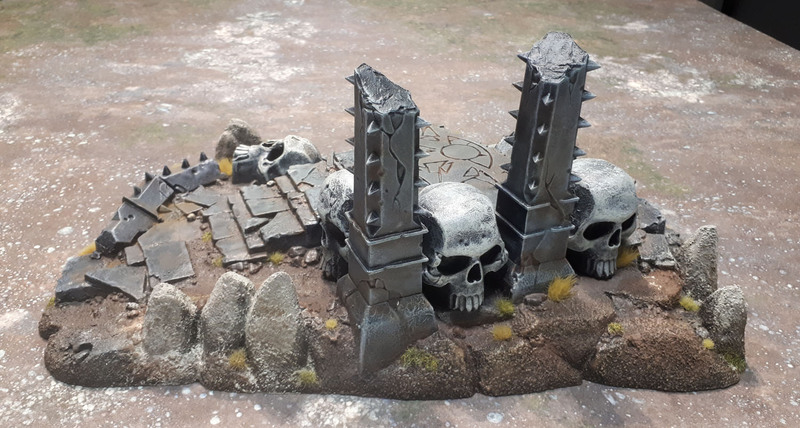 From the columns to the smooth stone platform, to the aged and weathered skulls, just looks awesome all around. I think they did a great job on it in the cover photo, honestly. The only thing I’m not enthused about is the colourful chaos star/eye. I guess the “trick” to getting different textures of a similar thing on the same model is to paint them discretely and as their own separate things rather then trying to do them all at once. Kinda like how I know *how* to paint orange slayer-hair or ginger viking-hair, but never write down a recipe or the exact paint colour combo – I just grab a set of colours that look right each time – so they still look similar enough, but not 100% uniform when the larger group are combined. Yea, I never keep track of hair or terrain.I wish I did sometimes though. Sounds like I do the same thing with hair. I grab several bottles, try to get an idea of what they will look like and lay them down as bases. If a color doesn’t look right, I drop it out of the mix. Then try and figure out what to use for wash, highlight, etc. That’s often where I will trip up though, as Vallejo doesn’t have a triad system. So if I used one of their colors, I have to pretty much guess, or just add white, etc. I’ll typically do all of one hair type, and then the next. So, ‘those four guys are going to be blond’, grab a bunch of blondish paints, ‘those four brunette’, etc. Yep – a good way to do it. There is one exception, though – Black hair – where I generally use Duncan’s YouTube guide or a simpler form of same (Depending on how much/where/type of hair). Oh yea, had watched that one before. It looks like it probably turns out really nice, but a bit of effort to get there. Might be able to get away with a brighter highlight and applying Nuln oil last, but I think it will likely still dull down too much. That’s why how far to take it is defined by how much hair is on the figure (and the type of figure). Dark Elf Sorceress? The works. Imperial officer under the hat? A touch of the dark blue-grey. It sure got that over the top feel with those big skulls, like 80s Heavy Metal bands. But like you said, it’s Warhammer! 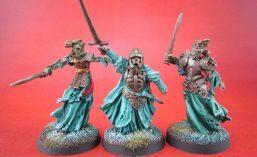 I’ve said for ages that if it would look good on an 80s metal album cover, it’ll look good in Warhammer! I throw up a little in my mouth just in referring to it as “metal”. 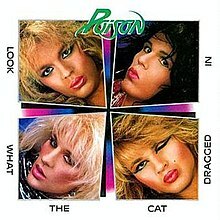 Yeah, I usually think of bands like Poison (and even more so ones like Faster Pussycat, Kix, and Dirty Looks) more as “sleaze rock” than any kind of metal. Never heard that term before, but it fits pretty much perfectly. She’s My Cherry Pie, indeed! On a chaos temple, it’s kinda forgivable at least. Though it’s still bloody cartoony. 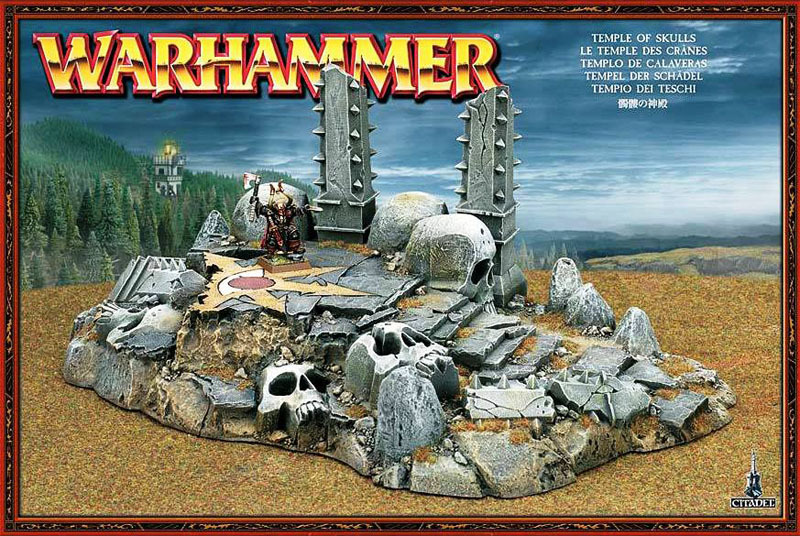 I wonder how much an old, beat-up Castle Greyskull might be on eBay? Impressive! I might not need one of these but I need to get some scenery done! Nice one on getting it done at last. I missed out on it, was a bit gutted when I wasn’t still easily available but hey ho, thus is life eh? Looking at those pictures the plain plastic is very smooth but you’ve done a great job adding texture to it, the whole thing looks much more organic now. Thanks mate. I may not be 100% happy with it, but I’m happy enough, and it does look a lot better than it was out of the box. Also glad I managed to get one while they were still around, and to finally have it done. 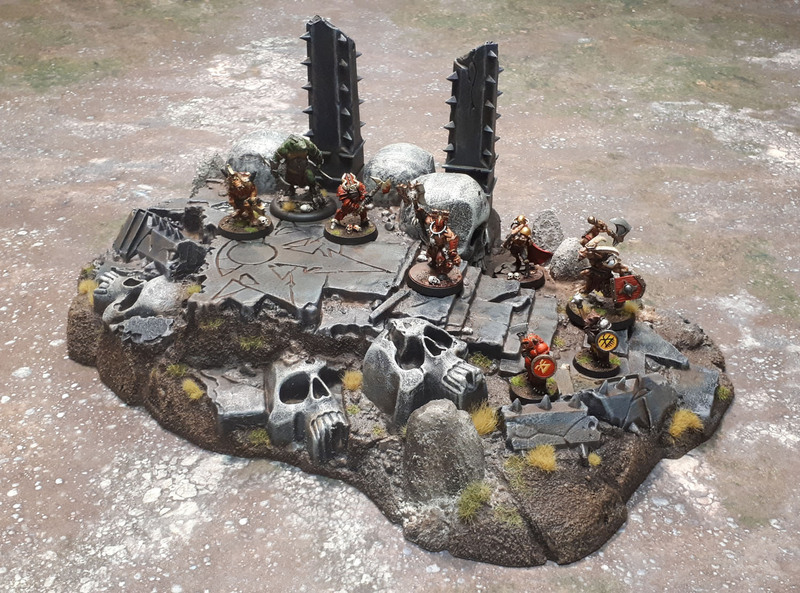 Nice bit of terrain. Like you say very warhammer- but not a bad thing because of it. Thanks Pete. Just means it’s a little more limited in use than the more generic pieces – but that’s no bad thing. I can’t use a WWII bunker in a game of fantasy or an Elven Tower in a game of SAGA, and yet everything works out. I’ve never had one of these, but one of my regular opponents does, and yeah, I’ve always had very mixed feelings about it. On one hand, it looks really cool in general form. On another, it is very lacking in texture. On yet another hand, it’s also a serious pain to fit Models on about 70% of it with them falling off, which can be a big problem when you have hand-to-hand combats going on on top of it. You’ve done a good job adding texture there. I wouldn’t think of the areas between boulders as dirt so much as gravel and scree and such. Small enough stones that they wouldn’t be individually distinguishable at this scale. The static grass really helps, too. I think that makes it just like any larger piece of scenery that’s not all flat, even ground, though. It’s always been the trade-off – right back to the differences between flat, stepped hills and rounded ones. The thing isn’t large enough to have too much scree in and of itself, but it depends on the wider environment of where it’s located from game to game. On a mat like the one I’ve photographed it, sure – on a jungle or grassy mat – notsomuch, which is why I’ve gone for a combo of earthy and rocky mounds. Agreed on the static grass, though. It was always the plan, but the difference before and after I added the tufts and static is huge. 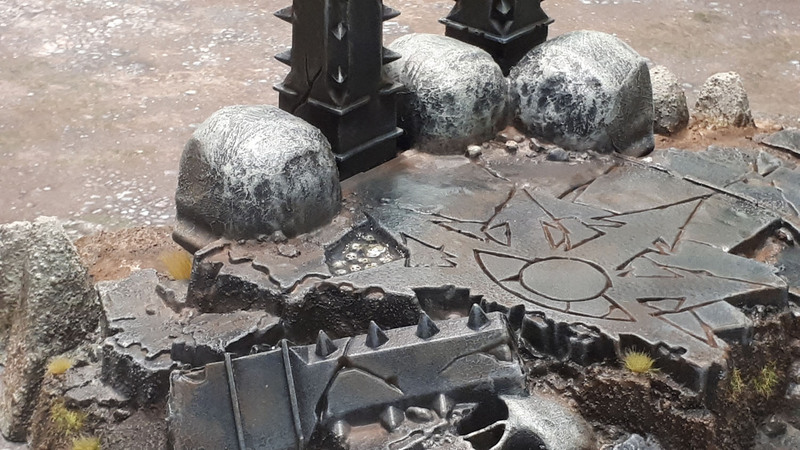 The smooth texture is often a problem with GW’s terrain kits, though, and the trick of stippling on Liquid GS has been a lifesaver for me more often than once. Looks great (and I want one badly. Too bad is oop by ages now). You might get lucky and find one on eBay/Secondhand or nesting in a dusty FLGS corner I guess, but yeah – I wouldn’t hold much hope. 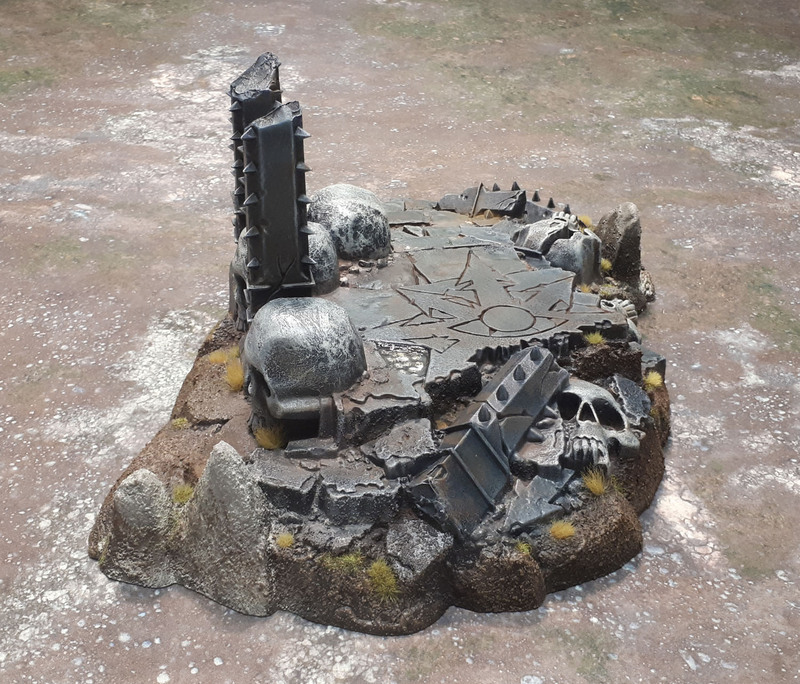 I’ve missed out on some of their terrain kits myself so I know the feeling. Missed the old Imperial Sector by literally a couple of weeks earlier this year as it was suddenly discontinued right when I finally had the money to buy it! That looks pretty awesome, the texture and the stone colour looks great. 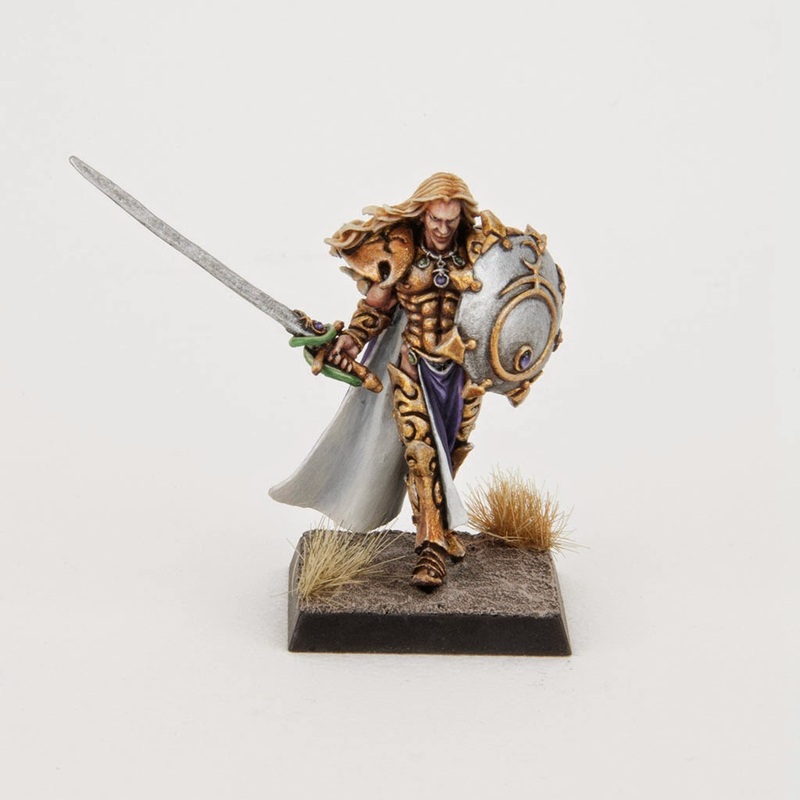 I nearly bought this when it came out, but decided against it because of the Warhammery kind of symbol, I did consider covering it up, but in the end gave up on the idea. Yeah, it very much depends on if you can get away with it (and the gigantic skulls) for your intended use and without too much hassle. Nice job dude, looks spot on to me! Very nice work there, I like the end result immensely, yes as you say it is a bit of a silly thing, but hey it’s fantasy there are lots of silly things there just because they look cool, I’m almost tempted to have a go at making one myself, even though I have no use for one at the moment! Well, I guess you have a full Dungeon Saga set at the very least with which you could play Song of Blades and Heroes or any other Fantasy Skirmish game – and that’s just for starters! Still, a nice paint job, Azazel. Well done on getting this to completion! I’ve always rated it a really dull kit, as it’s just flat spaces. But that makes it amazing to game over. Congrats for grinding through it all. Thanks mate. 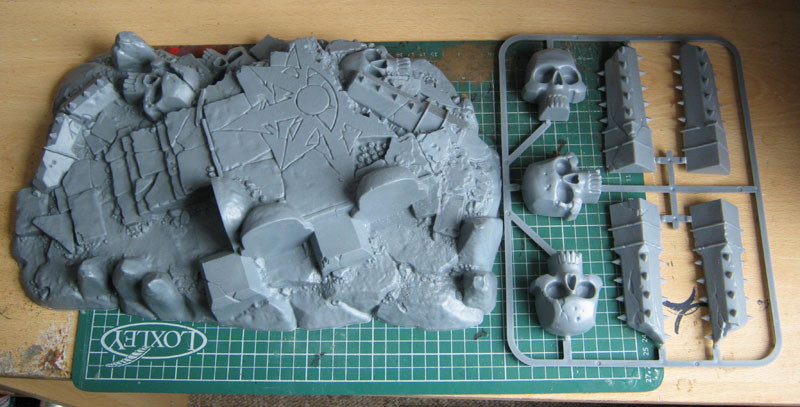 It’s that trade-off for terrain and terrain kits really. Working on another GW piece right now that’s really just a very attractive LoS-blocker rather than something you can actually game *on* or *over*. Hm, now that I’m a bi more removed from it, the rocks don’t bother me nearly as much, andI can even say that I think they look pretty decent. I’d rather be my own worst critic than have someone else do it for me, though!